Preheat the oven for 10 minutes at 350 degrees. Toast the bread in oven by drizzling olive oil on both sides of bread until light brown. Toast the tomatoes also with olive oil and salt and pepper until they turn golden brown. Now take out the tomatoes and let it cool down for some time. In a big bowl add tomatoes, basil, lemon zest, mozzarella cheese. Take out the bread now and place the tomatoes mixture and let it bake for 5 minutes. Garnish with crumbled feta cheese and mint / basil leaves. Bake them only when your guest arrives. Before that just prepare all ingredients. Adding only two tbsp. 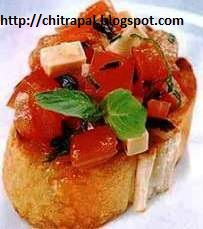 of cheese will be less fattening as compared to normal bruschetta and using all fresh ingredients is healthy as a dish. Thanks Mohit, do try and let me know if you like it. Hi Chitra I miss burschetta, since I have not made it for a long time. Thanks for the reminder and this easy recipe.